In my opinion, one of the best products from the Essentials line is the Monster Vault. There’s just so much to love! 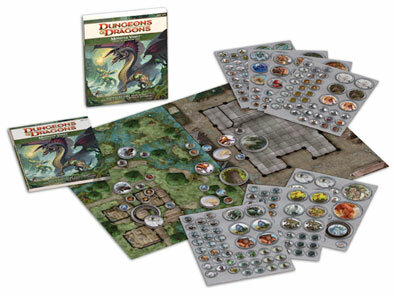 It includes a huge assortment of tokens representing all of the included monsters. “Cairn of the Winter King” is a superb adventure, with a great story hook, interesting encounters, and nifty magic items. I adore poster maps, and the one included in the Monster Vault is a nice one. As if that wasn’t enough, the book itself is perfectly-sized and chock full of detailed monster lore and improved stat blocks. It’s a great item and well worth a purchase for any DM. 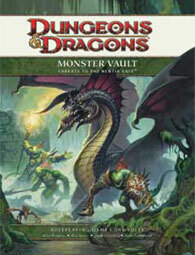 However, when the second Monster Vault was released this summer, I was very hesitant to pick it up. I was disappointed that the book was neither a full sized hardcover, nor a digest sized paperback. I wasn’t particularly impressed with the preview articles, either. And did I really need more tokens? Worst of all, there was no adventure included. Why did I need to buy this thing when I had access to all the stat blocks in DDI anyway? Obviously, I eventually changed my mind and picked up Monster Vault: Threats to the Nentir Vale. I am happy to report that, despite my initial concerns, it is a great product. While my nitpicks about the actual format of the book itself still remain, the content more than makes up for it, as do the stellar extras included in the package. The included poster map is double sided, with two half-sized maps on each side, for a total of four different encounter areas. The detail on these maps is amazing, easily the best of any that I own. In addition to looking pretty on the table, the layouts themselves are interesting. There are all manner of choke points and hiding places that make for compelling tactical decision making. The four battle maps include a hilly forest clearing with rock outcroppings, a small cave dungeon with a stream and a huge crevice, an urban building that could easily be modified on the fly to represent a temple or warehouse, and my favorite, a small hut next to a swampy marsh. Each map is generic enough to be used repeatedly throughout any campaign, which is a definite plus. As far the tokens, they continue the strong precedent set by the first Monster Vault: they are excellent. There are eight sheets worth of tokens, representative of each monster or villain in the book. The art is simply fantastic on these, and they are an improvement over prior tokens in that the name of the monster is shown on the bloodied side. I like having the name on these for more efficient storage and ease of access, but they are slightly less useful in a generic sense as a result. If you like tokens, you’ll love this set. The meat of the product, of course, is the large softcover Threats to the Nentir Vale book itself. The 128 pages of the tome are glossy, like 4E hardcovers, and the binding and cover feel very sturdy. Inside the book are dozens of monsters and villains, all created using post-MM3 math. As an old school D&D fan, I was thrilled to see old standards like the gory penanggalan, the vicious peryton, and the eerie hound of ill omen. 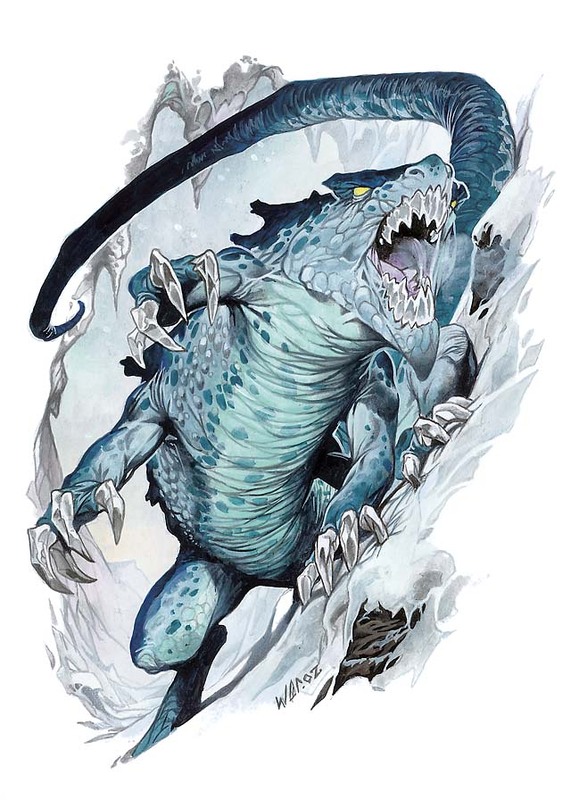 I do wish there were more of these generic creatures from D&D history in the book, particularly those from MM1 and MM2 that really need updating. (It appears that Wizards has decided to use DDI for these kinds of revisions.) The rest of the book is dedicated to specific, “named” monsters and villains scattered around the Nentir Vale. As a new DM, with little experience in the Nentir Vale setting, which itself is intentionally vague and ill-defined, the lore and history represented here are invaluable. In truth, these details will have more of a direct impact on my campaign than the stat blocks ever will. The Nentir Vale is fleshed out and given the substance that it sorely needed. 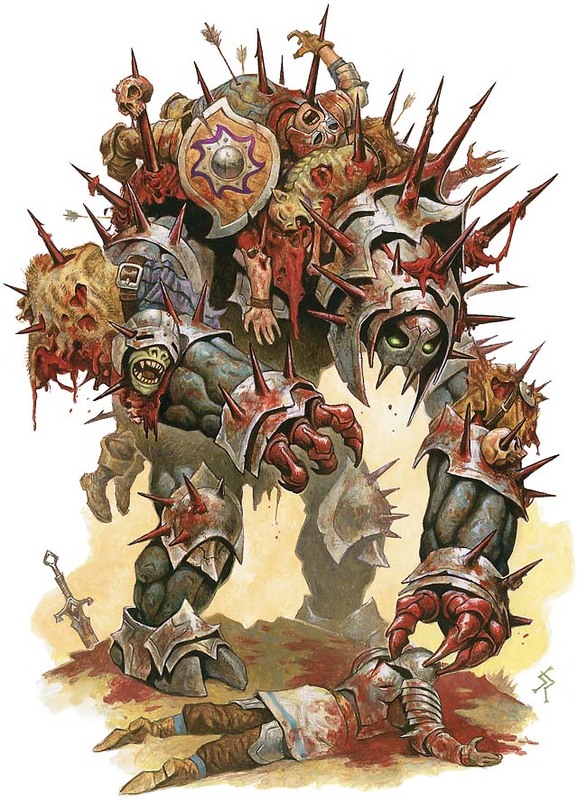 Bands of humanoid foes like the Daggerburg Goblins, the Bloodspear Orcs, and the lizardmen from the Witchlight Fens now feel less like random groups of stat blocks, and more like organic parts of a natural, realistic, yet still fantastic setting. Villains like the Iron Circle and the Tigerclaw Barbarians are given similar treatment. Each entry is so full of good information that I suspect you could run an entire campaign based on fighting one group alone. The book is extremely readable, highly useful, and fills the gaping need for a Gazetteer-style resource in the Essentials line. Are there any drawbacks to the package? There are, but they are quite minor. I’ve already mentioned the format issue; it’s a bit of a hybrid that doesn’t fit with small Essentials books nor with the hardcovers. The bulk of the monsters are heroic level, with the remaining minority at paragon level. If you want epic monsters for your campaign, you’ll have to look elsewhere. I also wish it was packaged in a box like its predecessor instead of just wrapped in a flimsy sleeve. All in all, though, Monster Vault: Threats to the Nentir Vale is an amazing addition to any 4E DM’s library. The Nentir Vale setting is generic enough that any of the entries could be used in other worlds fairly seamlessly. The battle maps are top notch, the tokens are excellent, and the book itself is simultaneously full of fluff and packed with crunch. This set is worth every penny and my only regret is that I didn’t pick it up sooner!